The purpose of the visit was to get acquainted with the construction site of the new Leningrad Nuclear Power Plant units which are reference for the Finnish Hanhikivi-1 NPP currently under construction. The Holding specialists gave their guests a detailed account of the organization of all processes at the LNPP-2 site, i.e. purchase and delivery of the equipment, system of interaction between contractors, and large-scale installation operations. 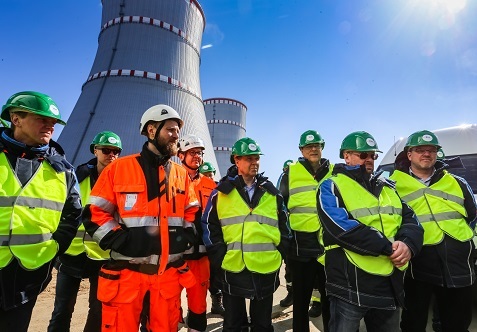 The Finnish specialists were shown the procedure for assembly of the reactor inner containment dome part and installation of the turbine unit directly at the second power unit construction site. All these operations will also be performed at the construction site of Hanhikivi-1 NPP. In this project, JSC CONCERN TITAN-2 acts as the main contractor. The information relevant for the companies interested or already involved in the project was provided at the meeting. In order to take part in the construction program, the Finnish organizations need to provide a full list of certificates for their products and pass tendering procedures.